Have you ever ordered a crab cake at a restaurant or picked one up at the grocery and was very disappointed when you put your fork into it? Anxiously awaiting the sweet, delicate crab meat, but mainly got a forkful of bread crumds or other fillers? 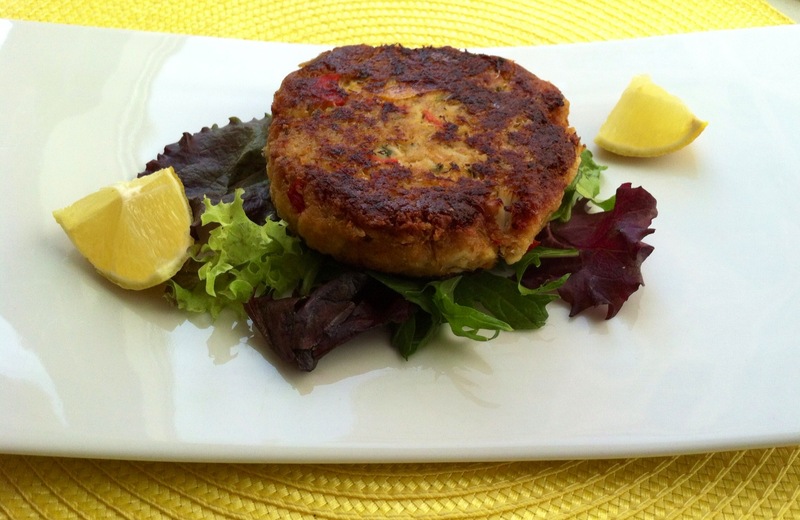 Well, these crab cakes will always be a huge hit because they are packed with mainly crab meat! Yes, carb meat! This recipe is very easy to prepare and feeds 4 people for around $5.25 per person. So next time you are in the mood for a delicious CRAB cake, follow this recipe and post your comments. Would love to hear your thoughts. Enjoy! In a food processor, chop to a fine consistency the red onion, celery, red bell pepper, yellow bell pepper and parsley. If you do not have a food processor chop, you may chop them very fine. Melt 1 tablespoon of the unsalted butter in a medium skillet over medium low heat. Add the vegetables and sauté for about 5 minutes. Remove and place in a small container in the refrigerator to cool. In a medium mixing bowl add the crab meat and loosen with a fork. In a small separate bowl beat the egg. Remove the vegetable mix from the refrigerator and add it to the crabmeat. Add the beaten egg, bread crumbs, mayonnaise and Dijon mustard. Mix well to incorporate all of the ingredients with a fork. Refrigerate for about 30 minutes. Divide into 4 equal patties. Take a large skillet, place over a medium low heat and add the 1/8 cup olive oil and 2 tablespoons unsalted butter. Once the butter melts adds the crab cakes. Cook for 7-8 minutes per side. Remove onto a paper towel to remove any excess oil. Serve with lemon wedges and a salad. Yes, Maryland is known for their crabs and crab cakes. yes i know, i used to live there and miss it for that reason and the beach.